Fourth grader Hailey Prater closes the circuit of several students, lighting up the Energy Stick with COSI Educator Bobby Petricini. Indian Lake Elementary first through fourth graders learned about the force that makes things move, light up, compute and more! 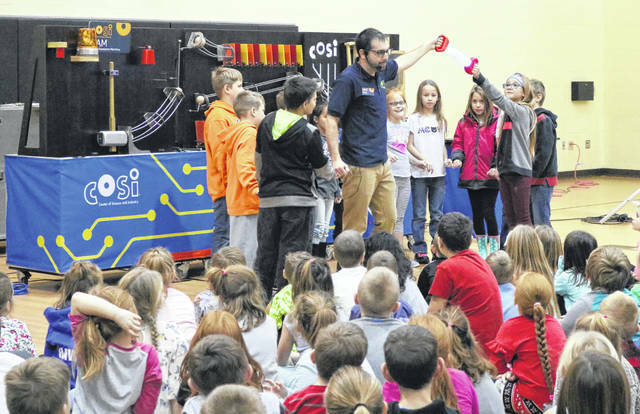 COSI on Wheels visited the school to present a program on energy. The event began with a COSI-led assembly. Students got to start the SAM-Super Awesome Machine with all kinds of energy. COSI Educator Bobby Petricini explained energy is in everything. Fourth grader Ethan Whitt let off a slingshot to release the energy in his muscles and the rubber bands. Meantime, several students got to complete a circuit to light up an energy stick. After the presentation, students visited several stations with hands-on activities showcasing different types of energy, including friction, conductors and insulators, magnetic, gravity, vibrations, contact forces, bright ideas and more.